Complement: 550 (ship) / 400 troops (normal) / up to 700 troops, max. The Fearless class amphibious assault ships were the first purpose-built amphibious warfare vessels in the Royal Navy. The class comprised two ships: HMS Fearless and HMS Intrepid. Designed as Landing Platform Docks, they were designed to transport and land troops by sea either using Landing Craft Utility or helicopters. As constructed, the ships have an internal dock that is accessed via the stern - while in port, vehicles can drive up the stern ramp and into the internal vehicle decks. At sea, the ships could partially submerge themselves at the stern, flooding the internal dock and allowing landing craft to come right up to the edge of the vehicle deck. Each ship carried four LCUs in the stern dock, with four smaller landing craft on davits on the superstructure. They provided accommodation for up to 400 troops, which could be increased to 700, if no vehicles were carried. 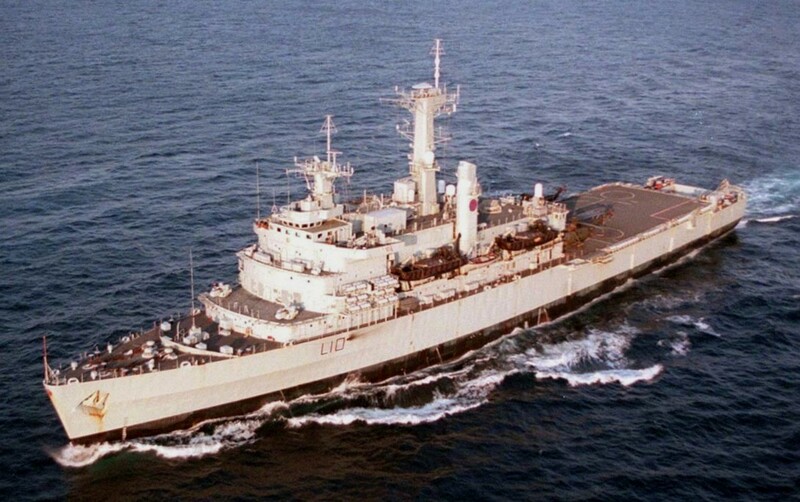 HMS Fearless (L10) was in service from 1965 until 2002. She was based in HMNB Portsmouth and saw service around the world over her 37-year life. She was the last steam powered surface ship in the Royal Navy. 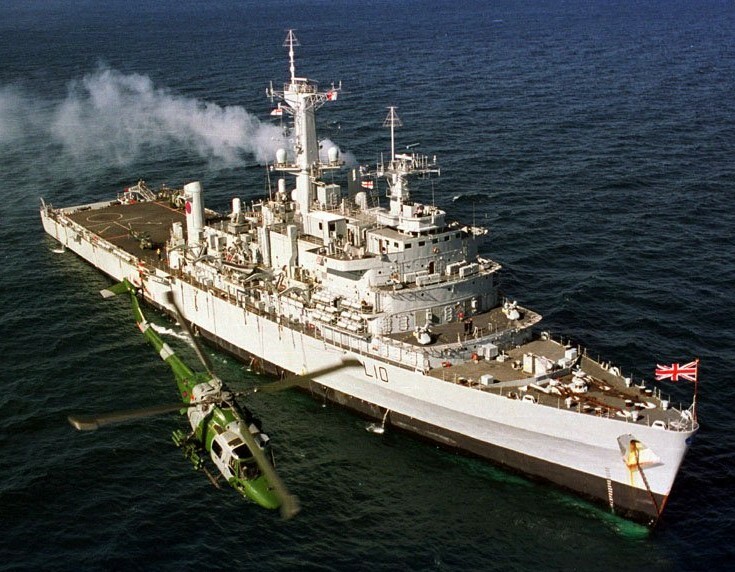 Following commissioning, her first operational tasking was acting as a command platform for British Counter-Terrorism operations in Aden, operating Royal Air Force aircraft and the Irish Guards prior to the British withdrawal as Flag of a 25 platform task group. Following the Aden experiences, in 1968, she was the venue for talks between Harold Wilson and Ian Smith over the future of Rhodesia. The latter had unilaterally declared independence(UDI) from Britain due to Britain's insistence on the removal of white minority rule. 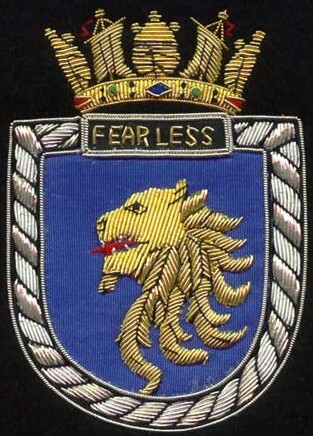 In 1972, Fearless ferried several Centurion AVRE demolition vehicles, derived from the Centurion tank to Northern Ireland to be deployed there as part of Operation Motorman. Fearless featured in the 1977 James Bond film The Spy Who Loved Me as the ship which picks up Bond's escape pod. The filming took place the previous year near the island of Malta. HMS Intrepid (L11) served from 1967 until 1999. Based in HM Naval Base, Devonport, Plymouth, Devon and HM Naval Base Portsmouth, she saw service around the world over her 32-year life. Intrepid was the second of her class of purpose built LPDs used by Royal Navy. She was built in Clydebank, West Dunbartonshire, at the John Brown & Company yard and was launched in 1964 before undergoing trials and commissioning in 1967. She was the last ship built by John Brown & Co for the Royal Navy. Intrepid became the first Royal Navy warship to be fitted with satellite communication equipment in 1969. As a result of defence cuts, Intrepid went into reserve in 1976, being brought back into active service in 1979 to allow Fearless to be refitted. 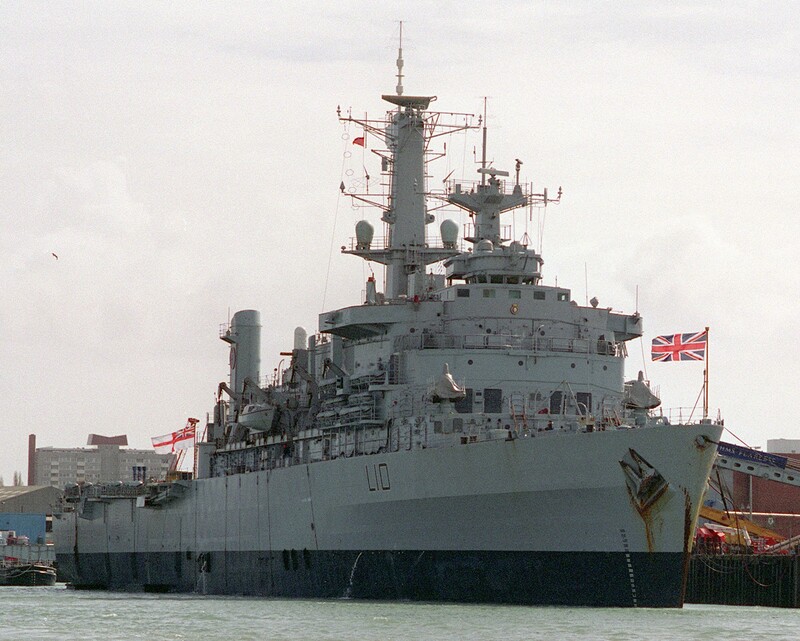 It was announced in 1981 that the two LPDs were to be deleted, with Intrepid undergoing decommissioning in 1982 at the outbreak of the Falklands War. After decommissioning, the Royal Navy was due to sell Intrepid to Argentina. However, Intrepid was brought back into commission, with her ship's company recalled by Commander Bryn Telfer (the Executive Officer), and Malcolm MacLeod, the crew gladly returned to form part of the task group committed to Operation Corporate, the British effort to recapture the islands. Intrepid was commanded by Captain Peter Dingemans. With elements of 3 Commando Brigade embarked, Intrepid took part in the amphibious landings at San Carlos Water. 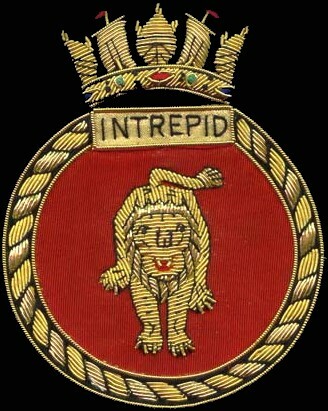 HMS Intrepid was under attack in San Carlos Water on 25 May 1982, with a few fatalities, mainly Royal Marines. The Nordic Ferry was also under attack. She came under heavy air attack once again during the operation, and was the main participant in the landings at Bluff Cove on 6 June. Margaret Thatcher and Sandy Woodward commended the efforts of the ships involved in the San Carlos attacks. She Intrepid would be the last ship to arrive, the last piece in the jigsaw, and so all the timings depended on her. As well as being one of the warships used for imprisoning the Argentinian prisoners of war, the surrender ending the Falklands conflict was signed on Intrepid's deck. Intrepid was refitted at Devonport Royal Dockyard between January 1984 and June 1985, with two Sea Cat launchers removed, with twin 30 mm anti-aircraft mounts and two single 20 mm cannon added. From June 1985 until 1990 she supported the sea training phase of initial officer training, undertaken at Britannia Royal Naval College, as part of the Dartmouth Training Squadron. 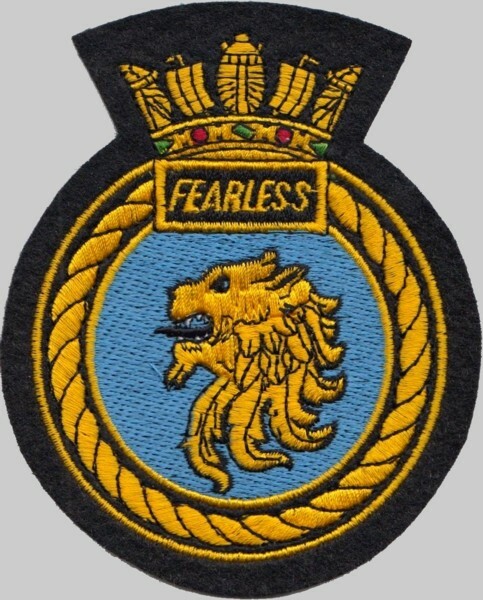 During the early years of their service, Intrepid and her sister ship Fearless carried a number of soldiers of the regular Army as part of their fixed crew. This happened because in the late 1960s and very early 1970s, the strength of the Royal Marines had been cut severely by the then Labour government (Harold Wilson) and the Marines were unable to fulfill a number of the amphibious liaison posts on board the ships. In the case of HMS Intrepid, the army crew included a signal troop (661 Signal Troop, Royal Signals), a detachment of Royal Engineers (beach clearance duties), a small team of drivers from the Royal Corps of Transport (vehicle deck handling) and REME recovery mechanics who operated the BARV - Beach Amphibious Recovery Vehicle. This was a tracked recovery vehicle, based on a Second World War Centurion Tank chassis, with built-up sides. Its function was to recover drowned vehicles during a beach assault. 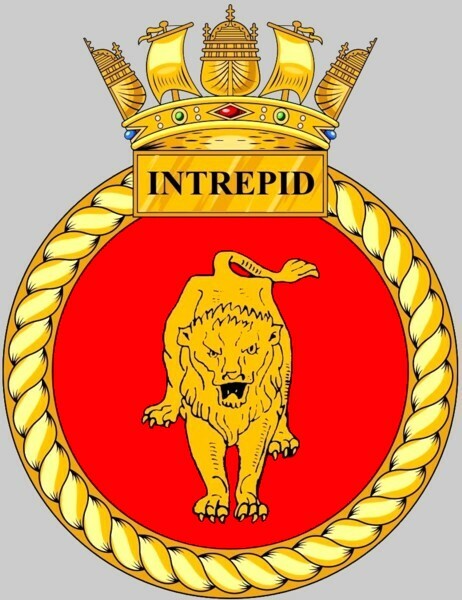 The Army element of the crew of HMS Intrepid was in place from its commissioning in 1967, to December 1973, by which time the strength of the Royal Marines had been substantially improved and they were then able to fulfill all the above posts themselves. Intrepid was placed in reserve status late in 1990, when Fearless completed an extensive refit. Intrepid was in poor physical condition by this time, which prevented a similar upgrade, and was laid up at HM Naval Base Portsmouth. Intrepid was used as a source of spares for her sister ship, HMS Fearless. She was decommissioned in 1999 and awaited her disposal, by scrapping, in Fareham Creek, Hampshire. On 12 February 2007, the MoD announced that HMS Intrepid was to be recycled at a British facility. Leavesley International was selected as the preferred bidder, pending license acquisition. The contract aimed to ensure that the ship was disposed of responsibly, and in full compliance with international environmental legislation. Having received the required planning permission and environmental licences for disposal, Intrepid left Portsmouth for her final journey to Liverpool on 13 September 2008. Having been previously suggested as potential diving site on the southcoast, various veterans of the Falklands War started a petition on the 10 Downing Street website to preserve the ship as a memorial to the conflict. But in late January 2009, the Daily Mail published an article showing the half demolished ship in Liverpool Docks, which was reported to be on target to be 96% recycled.